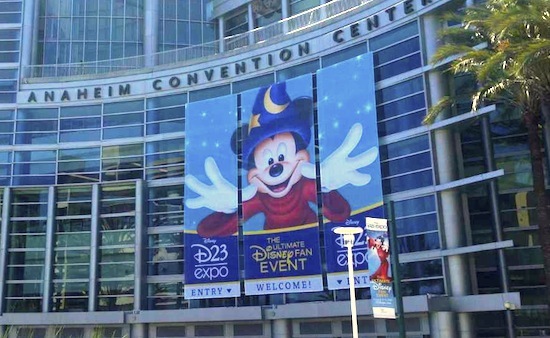 The 2013 D23 Expo was held Aug. 9-11 at the Anaheim Convention Center in Anaheim, Calif. We have a recap of some of our coverage as well as videos released by D23 to highlight some of the many events that happened at the ultimate Disney fan event. Let’s start with a look at the two big panels over the weekend, showcasing Disney’s upcoming animated and live-action films. We filmed our entire Aug. 15 episode of The Show at the Expo. The episode featured interviews with Imagineers and celebrities from upcoming animated films, tours of the show floor and Parks & Resorts pavilion, and more. Once again D23 held a Voices of the Disney Parks panel, and we were able to capture it again this year. Here’s a look around the Parks & Resorts pavilion at the Expo. Also in the Parks & Resorts pavilion, there was a mock office setup featuring research about Avatar Land for Disney’s Animal Kingdom. Here is an interview with an Imagineer about it. At the Parks & Resorts pavilion, Captain America made his first Disney appearance, meeting & greeting with guests. There was even a surprise appearance by Dreamfinder and Figment at the Expo. A rarely seen Haunted Mansion character was brought out from retirement to be displayed at the Expo. Dr. Doofenshmirtz brought his Waffle-inator to the Expo, allowing guests to try their hand at it. The Disney Legends ceremony had a wonderful tribute to the late Steve Jobs. Tony Baxter was also honored as a Disney Legend, with a special appearance by Dreamfinder & Figment. There were also plently of performances, appearances, and announcements made this year. To see our full playlist of videos, head to our YouTube channel. Wow! So much amazing photo and video coverage of the expo. Thanks Attractions Magazine!